When Hank is culled, Clint and Gretchen must put aside their personal feelings and find a way out of the prison, surrounded by thousands of starving zombies, before Hank becomes just one more disposable guinea pig in the hands of a twisted mad woman. “When you’re facing a crowd of zombies, there’s no time to think,” a woman’s voice said behind him. “If I were a zombie, you’d be a three-course meal right now.” The woman, who was maybe a few years younger than him, snapped her jaw and laughed. “Or a new zombie, yourself,” another male voice said. Clint looked over her shoulder to find the male version of his attacker standing about twenty feet back from the scene. Next to him, a mountain of a man smirked with amusement. All three of them were nuts. She shaped her hand like a gun and pressed it to his forehead. “No, I’d kill you before I let that happen.” She said it casually, like telling someone lunch was ready. “Thanks?” Was this some sort of weird initiation? The woman leapt to her feet and yanked him up after her. She tapped the back of his skull. “When you’re attacked, your lizard brain takes over. You have to do something like a sword swing or a roundhouse kick thousands of times so that it becomes instinctual. Hesitation is fatal.” She punctuated her words with practiced movements; the swinging of an imaginary sword and a roundhouse kick aimed at the practice target. “Right.” He had known this, of course, but had forgotten it in the absolute boredom of swinging the sword the same way for hours. The woman stood there with her hands on her hips as if she were waiting for some kind of applause. He didn’t know what else to say that would keep her from jumping him again. Though, now that he got a good look at her, maybe he wouldn’t mind another roll in the dirt. She was tall, with long legs bared by khaki shorts. A tiny white tank top stretched over a black sports bra that definitely earned its keep. Lean muscle stretched along the full length of her arms, torso, and legs. Strapped to her legs and waist were weapon holsters of all varieties that – in his mind, at least – only made her sexier. 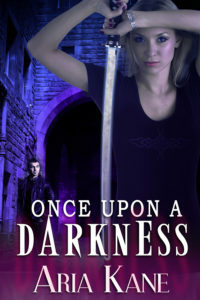 To celebrate the release of Once Upon a Darkness, Aria Kane is giving away a Kobo Vox (Android) eReader with a red leather case to one winner (US residents only), and a choice of any Entranced ebook to another winner (international entries welcome). Aria Kane is a recovering mechanical engineer and romance writer. She lives in sunny Florida with a 60 lb mutt who thinks he’s a Chihuahua.